Nilambur is a small town in Malappuram district of Kerala.It’s reachable by a 5 hour train journey from Cochin. Decided to paint a very beautifully located house near the station. The purpose of my visit was to see a very old house (an ‘Ettukettu’ house).’Ettu’ means ‘eight’ and ‘Kettu’ means ‘built up sides.’ Ettukettu is the house with two quadrangles or mansions with eight salas (square or rectangular living rooms with verandahs on one or more sides) around two courtyards. A beautiful house replete with wooden staircases, great creaking wooden doors and musty smells reminding inhabitants of the era gone by. 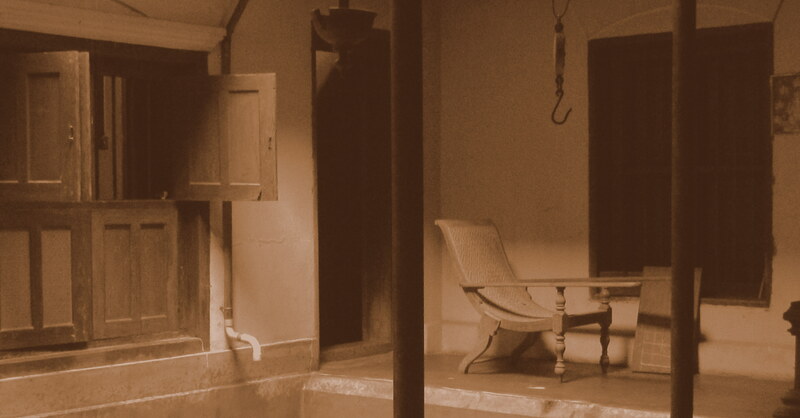 The walls still reverberated with the echoes of of the past.Relics scattered around – an old ‘Doli’ , the ‘thoppi koda’ ( a bamboo cap which also served as an umbrella for labourers), kitchen antiques ( old urulis, stone urns) and even the nettipattom (gold adornment) of an old elephant. One of the courtyards has been retained as such and one adjacent to the kitchen has been converted into a well. The cooking is still done by burning firewood in earthen stoves. The dining area was divided into three halls , one where the upper caste Namboodris used to eat, one for other men and the third for women. Adjacent to the house is the temple belonging to the house and further down is a private kollam (lake). 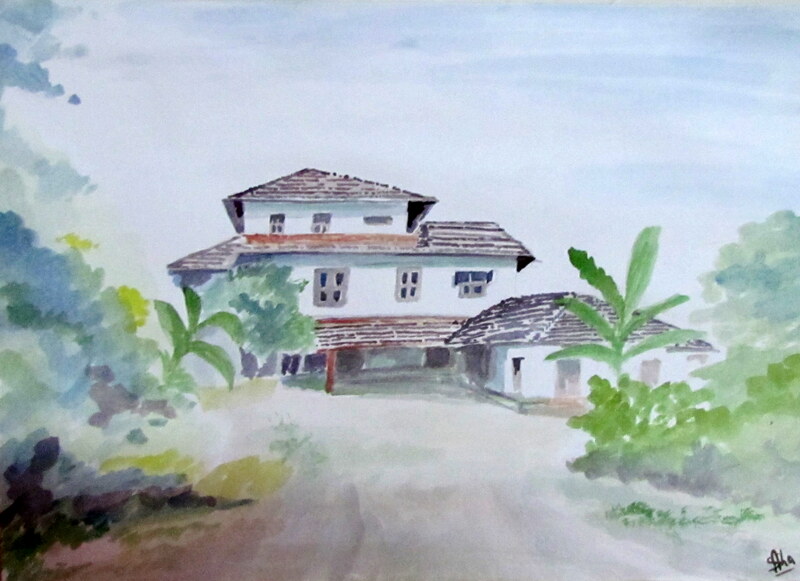 My painting of the house in Amarambalam. What an amazing experience! And beautiful paintings…. love them. 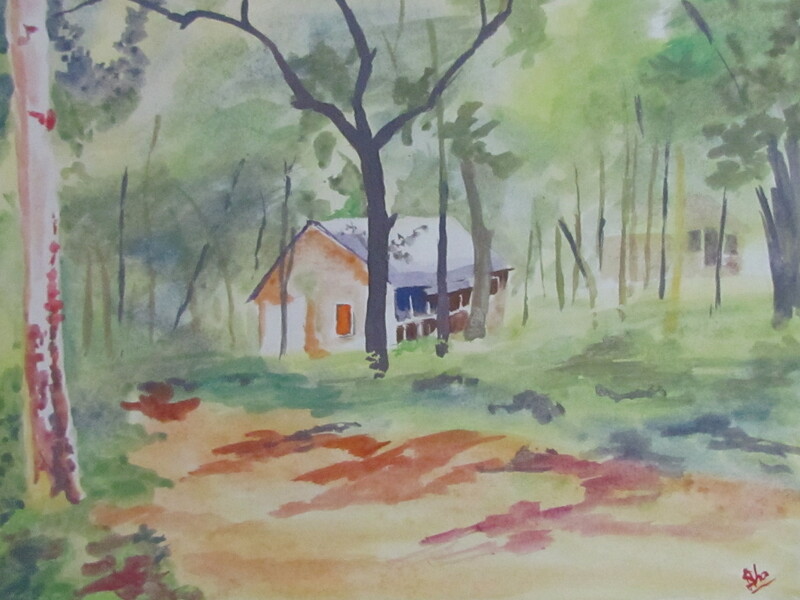 That is such a beautiful painting from Nilambur. I miss the old type of Malabar buildings in Nilambur with tiled roof.